At Tecnológico de Monterrey, Caty Flores is in the third year of her communication in digital media degree program. Not unlike students here in Korea, this is the time that many aspiring professionals hope to gather some on-site training before graduation. If you were to have asked her one year ago where she would be going to fulfil her token apprenticeship experience, she would have told you about her plans to go work on a television series to be filmed in Scotland. Sitting in a café on the Yonsei University Sinchon campus, she explained that her decision to come to Seoul was a last minute change of heart. Her older sister, enamored with Korean dramas, advised her that Korea would be a great place to study film. The quality of television shows and even music videos that are produced in Korea are world renowned and adored by millions for their uniqueness and intense storylines. After all, a previous screenwriting course syllabus included films by Korea’s Chanwook Park, the creator of the Oldboy Trilogy. With the added encouraging nudges from friends, Caty decided to find a Korean language tutor and get ready to go to Korea in the fall. 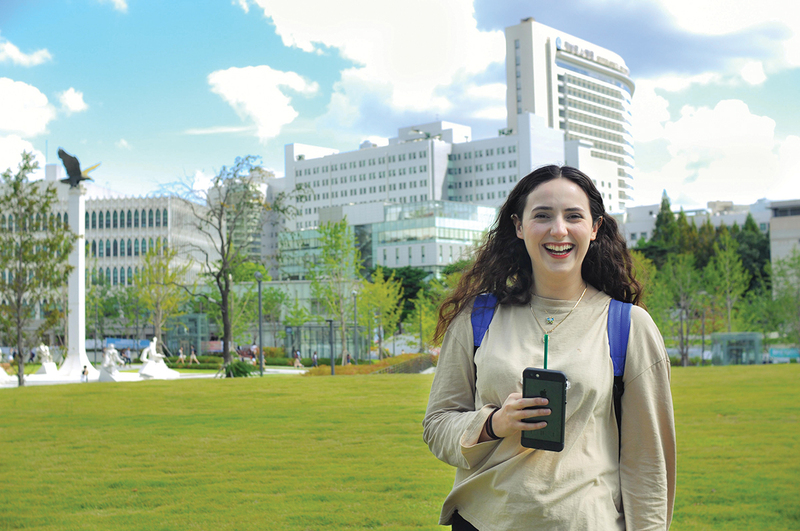 An eager linguaphile, she put Yonsei at the top of her list after seeing users online proclaim Yonsei to have the best Korean language program. “In screenwriting, every experience counts.” Caty is absorbing and processing all of her experiences in Seoul to develop a more diverse perspective on film production. Mexico and Korea share many characteristics when it comes to communications, such as mediagovernment relations. Though more than half of the students at Tecnológico de Monterrey study abroad at least once, Caty Flores is the first student from her department to go to Korea. The Korean wave has yet to take over popular culture in Mexico, but there is growing intrigue. Enrolling in courses such as Media Studies, Advertising, and Korean Media, Caty hopes to explore the similarities and differences and learn more about the variety of film styles in Korea. Already, Caty has become a trendsetter at her home campus. She hopes to be the first of many to choose Korea as a study abroad destination, and by doing so add more diversity and global perspectives to Tecnológico de Monterrey. After she returns, she will advocate for others to follow in her lead, gaining practical knowledge and making memorable experiences at Yonsei.